A bi-monthly look at the arts and literary scene. Many of your absurdist tales seem to culminate in climaxes that reveal their own internal logic. When you begin drafting an absurdist tale, do you therefore know in advance how it should finish? Sometimes I do and sometimes I don’t, and sometimes it’s somewhere between the two extremes. A story can be very carefully planned. For example, with my novel The Percolated Stars I planned each chapter in advance, so I knew what was going to happen in the story when I sat down to write it, but actually I did make adjustments when I was filling in the details too. This method is almost geometric. I might see an overriding shape, a symmetry that controls the story like an internal or external skeleton. With other stories I set off blindly, having no idea what’s going to happen, and writing stories in this manner is almost like reading them as I write. This is the method I am using with the story I’m writing at the moment, a weird Western called The Honeymoon Gorillas that may turn into a novella or even a novel. I don’t know where it’s going or what’s going to happen in it yet. But even this method isn’t as purely random as it might sound, because as I progress with the writing, certain aims and objectives slowly begin to create themselves, to form vague patterns that become sharper as the story moves ahead. It’s like mist starting to form a definite outline. When I work this way, I generally just leave lots and lots of loose ends lying about, as many as possible, and don’t worry about tying them up, because they will often tangle together and tie themselves up. This creates a pleasing unpredictability. Any loose ends that don’t tie themselves up on their own, I will turn my attention to as the story reaches a conclusion. Both these methods have their advantages. Often, however, I will work in a way that combines these extremes. I may have a very nebulous idea of what I want, and I will see certain scenes with clarity, like stills from a film, and then I will try to link what is certain with what is still unknown. Or I may have a very precise frame for the story but within this frame anything can happen provided it fits the frame properly. That’s a bit like some forms of jazz, I guess. Also, I am happy to change direction at any stage in a story and to keep changing it, so I do tend to surprise myself. But now I am no longer really surprised that I surprise myself. Obviously you've approved them all, but which are your favourite tales in BRUTAL PANTOMIMES — and why? The first and last stories in the book are my favourites. The opening story, ‘The Jam of Hypnos’ was written secretly in a busy office when I was working for a local government department many years ago. I was supposed to be preparing boring statistical reports on local health issues, but when my manager wasn’t looking I would type a few more lines of my story. With this particular tale I wanted to write something totally absurd that didn’t feel at all absurd. There is something peculiar I have noticed about weird tales. I know that weird tales are supposed to be peculiar, but I don’t mean that. I mean that all supernatural and weird tales are inherently absurd, but we don’t regard them all as absurd. So we treat certain weird tales with a serious respect and others we consider comical pieces. Strictly speaking we should regard them all as comical, but we don’t. It’s something to do with tone. A story by M.R. James, for instance, such as ‘A View from a Hill’ is actually extremely silly in its conception and execution. It’s as comical as a story about, let’s say, a walking talking chair that learns to ride a unicycle. But the James story doesn’t feel comical or silly, despite the fact that binoculars filled with the juice of boiled bones that enable one to see into the past is no less daft an idea that that of a living chair pedalling a unicycle. So I became acutely interested in why this should be. The discrepancy fascinated me. With ‘The Jam of Hypnos’ I tried to write a story that was impossible and utterly whimsical but which felt like a serious weird tale. And it seems to have worked. Readers who don’t like the comical or whimsical or ironic in fiction have praised the story, even though it ends with a man sailing a lake of jam on a raft made of toast. I have used a certain tone and style to deflect the impact of the nonsensical resolution of the story and to make it seem acceptable to those who only enjoy very straight and serious weird tales. As for the last story in my book, the novella ‘The Impossible Inferno’, this is very special to me for several reasons. The central idea of the story is one I carried around in my head for most of my life before I felt ready to embody it in a proper story. I had the idea when I was very young and I knew I lacked the ability to power a story with it then, so I kept it and allowed it to gestate deep in my mind. Finally I sat down and wrote it and it ended up being my 500th story. Where did your seeming obsession with puns stem from — and does it pre-date your literary influences? Am I obsessed with puns? Maybe I am. If so, it certainly doesn’t predate my literary influences. It certainly would have come from the books I was reading that I found enjoyable for reasons of their wordplay. Finnegans Wake is the obvious example, but I didn’t read anything by Joyce until quite late in my working life. A more plausible direct influence would be Barefoot in the Head by Brian Aldiss, which utilizes the brilliant conceit that a world war has been fought with psychedelic weapons in order to simultaneously evolve and devolve the language the story is told in. As perceived reality becomes more distorted, so language adapts accordingly. This is still one of my favourite Aldiss novels. Two other books had a similar, perhaps even stronger effect on me. Cabrera Infante’s La Habana para un Infante Difunto and Julián Ríos’ Larva: Babel de una noche de San Juan. Both are not only rife with puns and other verbal tricks of language but also burst with a vigorous eroticism that seems amplified by the way the authors approach the problem of style. The vitality of what happens is matched by the vitality of the telling and both books are not only playful but powerful and enthralling too. Both examples are unusual because modern Spanish literature is not noted for its love of wordplay. The days of Quevedo are long gone. French literature, on the other hand, has many examples of writers who indulge and experiment with puns and wordgames very entertainingly. Boris Vian is one of my main literary heroes and his novels are packed with puns and verbal pyrotechnics. The originality of his language complements the originality of the substance of his books, which are always delightful. He was also a jazz musician and I wonder if the way he wrote somehow was an analogue of the kind of music he played? When I first read his Froth on the Daydream, I realised that I had encountered a writer who was my ideal type. But I must have loved puns before then in order to go with his flow so willingly. I doubt that anyone who dislikes puns can be converted into liking them by any book in existence. What compels you to being quite so prolific? Ideas appear in my head all the time. They keep coming and I have to embody them in stories in order to make them go away. If I don’t do this, they will keep on bothering me. When I began writing stories I found the creation of ideas to be hard work, but it’s a question of practice, like anything else. The more you pedal a bicycle, the stronger your calf muscles will become. The more you balance on a giant sphere, the less likely you will be to fall off. The more often you knit with partly boiled spaghetti, the greater the chances that a pasta cardigan will eventually become fashionable reality. And the more you try to write stories with unusual ideas, the more easily and smoothly unusual ideas will come to you, whether you want them to or not! I have reached the stage where ideas come unbidden. They come of their own accord at all times of the day and night, but chiefly when I am out walking. So many ideas come to me now that I have to use up many at the same time by putting them all into one story and seeing how they react to each other. Often they clash or combine and generate something unexpected and useful. This is one of the reasons my style is the way it is. It sounds as if my work will be cluttered as a result but that’s where the challenge to make all the diverse elements fit together properly comes in. That’s what requires the extra effort. I've read elsewhere you saying you've no interest in being 'political' in your tales. Yet, like several of your literary influences, it is often downtrodden or disadvantaged protagonists who fight to gain freedom or some kind of salvation and often succeed. Could you clarify your position? I don’t set out to be deliberately political. I have no left wing or right wing or any wing agenda to promote. As for the downtrodden protagonist who fights against the system, such an individual can represent any or no political ideal. The desire to win freedom is deeper than politics, in my view. It’s at the core of existence. Of course, there are those who say that everything is political, and they may well be right, and I guess that liberty is often seen as the biggest political issue of all. But in my own mind ‘political’ fiction means something different, something other than a simple connection with the pure questions of freedom. It means not only a kind of fiction that has an intention to pass on a set of predetermined social or economic messages that have been approved by at least a sizeable minority of other people, but also that there must be some sort of bureaucratic element to the messages. In other words the ideas in the messages are going to need a certain amount of paperwork in order to be implemented. There are going to be financial ramifications, agreements drawn up, contracts, diplomacy, a lot of effort. But freedom shouldn’t have a bureaucratic input at all. So I really don’t think I do political fiction. I guess that the most political aspect of my life is an environmental awareness, but I don’t consciously use my fiction to promote environmental issues, or if I do, then it’s not systematic. But it’s certainly true that the environment is the most important political issue we have right now. Without an environment, none of the other political issues can even exist, because we simply won’t be here. What literature, or authors, do you read that might surprise people as having no obvious connection to your public work? I read a lot of fiction that has no connection or influence on my own work. In fact I often get more enjoyment from such fiction. The problem is that when we are young we read books for enjoyment. Then we decide we want to write books too, so we do. But when they are published and we become authors, we can no longer read books the same way we did. An author isn’t able to read in the same way as a pure reader. The author is constantly looking for techniques in the work he or she is reading, looking for clues, for ways to improve, for things to be deliberately inspired by. Reading becomes almost a search for style, a quest for advancement. Authors can’t immerse themselves in the reading experience is the same way. This is why it’s a relief as well as a pleasure to read books that form no part of one’s own strivings. So most of the books I read are not fantasy based. They may be ironic or satirical or philosophical, but they tend to have at least one foot in this world. Thinking about the authors who I have discovered in the past few years who have most impressed and entertained me, few are associated directly with fantastical or weird writing. Ismail Kadare is probably the best writer I have discovered in recent years. At this very moment I am reading novels by V.S. Naipaul and R.K. Narayan, both of them writers with similar concerns but very different approaches and intentions. Milan Kundera is another author who has been a recent enthusiasm. Antoine de Saint-Exupéry is one of my heroes. When I was younger I tended to go for fantasy and science fiction over anything else. These days I often ignore the fantasy and SF sections of a bookstore altogether. It could simply be, I guess, that I have read so much fantasy and SF over the years that I need a break for a few more years. That possibility has crossed my mind. Your love of the Mediterranean and its various cultures is well known. Is its past culture – to us more conservative Northern Europeans - of hedonism and eroticism of particular appeal? And to what extent do you consciously, or otherwise, draw upon them for your work? I am sure that the hedonism and eroticism are a large part of the appeal. I know, for instance, that epic fantasy with its roots in the Nordic world, the myths and cultures of the north, has never quite enthralled me in the same way as those more sultry romances that seem to stem from a southern influence. I use the word ‘romance’ in the old fashioned sense. There is also the fact that the Ancient Greek myths were a big part of my childhood reading. The ambience stayed with me. The answer might even be more straightforward than seeking some kind of aesthetic or spiritual connection. It could just be that I prefer warmer climates and I abhor the cold. This is something else that has changed over time. Winter was once my favourite season and the possibility of a snowball fight excited me beyond measure. Now I dread the onset of winter. I am a summer man entirely. This is true to the extent that I truly live only in the summer months. Half of my life is spent waiting and praying for summer. It’s not a real life. I think that spending time in Africa reset my internal thermostat somehow. The obvious solution is to permanently move to a warm country, of course, but this requires money. Nonetheless it remains my goal. I need to find a way of writing books that are more popular than the ones I currently write in order to finance and facilitate my escape. I'd like to thank Rhys Hughes for taking the time out to respond. Newly-reissued in paperback is Reggie Oliver's third collection, originally published by Ash-Tree in 2007. As with his others,' derivative of any other author of the strange they are not. The alleged 'horror' in Oliver's tales rarely, truly rears its head until the denouement. Up until that point, we are on the trail of some seemingly conventional mystery; however, where most of this genre's authors' set a scene heading for some near inevitable downfall, Oliver's disarming wit and personal knowledge of the suburban, thespian classes of Southern England he writes about can successfully blind the most seasoned reader to the most unforeseeable outcomes. We rarely share in the Gothicists' dark, internal mania that builds to the inevitable climax. Instead, we are treated to informed, well-crafted and moderately-paced situations redolent of those TV anthology series of the Seventies, filtered through Oliver's brand of disarming irony. The old skool feel stems from his experiences as a then young stage actor and subsequent playwright. A quite unique writer's resume amongst the current generation of 30-40-something bedroom-based Goth Horror-ists. Regional archetypes represented here include an elderly National Trust guide with an unwitting, sinister connection to the grand house's history; ('The Man in the Grey Bedroom'); a children's entertainer whose true character harbours something much worse; ('Mr. Poo-Poo'); a vengeful spirit, in life betrayed in love, replays fate from a dilapidated theatre; ('Blind Man's Box); while a translator, down on his luck, is offered riches in exchange for prostituting his craft, which either pure logic or pure madness resolves. (The Machen-influenced 'The Silver Cord'). The combination of tales, as ever from disparate sources, works well; being as complimentary as they are contrasting. If there is any doubt, it is that some of the tales of modern-day setting feel rather too light to become full-bloodedly 'weird.' This has more to do with the aforementioned Home Counties settings, and staid types chosen, than the prose style, which always satisfies. Oliver is at his best when his narrative preception is ambiguous or strange, be it 'Bloody Bill,' (from The Complete Symphonies of Adolf Hitler) or 'Lightning' (in Flowers Of The Sea). Yet, like all the best authors,' he writes about what he knows, and what he knows rarely fails to engage. He is an individualist rather than a type and God knows we need more of them. I hope an equivalent reissue for the hard-to-find Madder Mysteries isn't too far away. What the authors say . . .
"The Pan Review has been a goldmine of good books." "One of the more thoughtful literary columns." 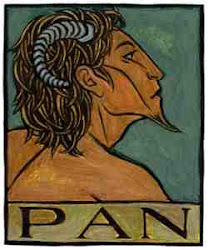 'Pan' image is copyrighted to Thalia Took (2004) http://www.thaliatook.com/AMGG/pan.html. Simple theme. Theme images by luoman. Powered by Blogger.